I had no time for a blog post yesterday – the decorating has started!! I knew the hallway was going to be a pain to redecorate. What it really needs is replastering, not just sprucing up, but the budget won’t run to that. I spent a lot of the day repairing the walls – filling in holes and patching up the wallpaper. We daren’t strip the old stuff off as it may be all that is holding the plaster together in places….Mr S did a very impressive repair of the artex on the ceiling. I wish we could get rid of that as well but for now it will be painted so it will look fresh and clean. The bannister was a bit of a job and took ages to rub down and wash, but at least I did manage to put a coat of quick dry gloss on and it looks so much better. White instead of aged yellow! The kitten likes to jump up and down on it and wind herself in and out, so I had to shut her away in the end. Mr S is coming over to help again today. 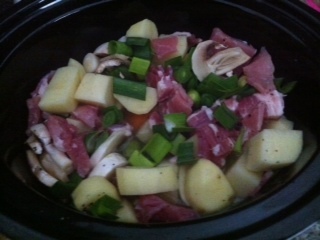 Because I know we will both be starving by tea time and won’t want to cook, I have made a slow cooker creation – Bacon, barley and leek stew. If it is a successful invention I will post the recipe.